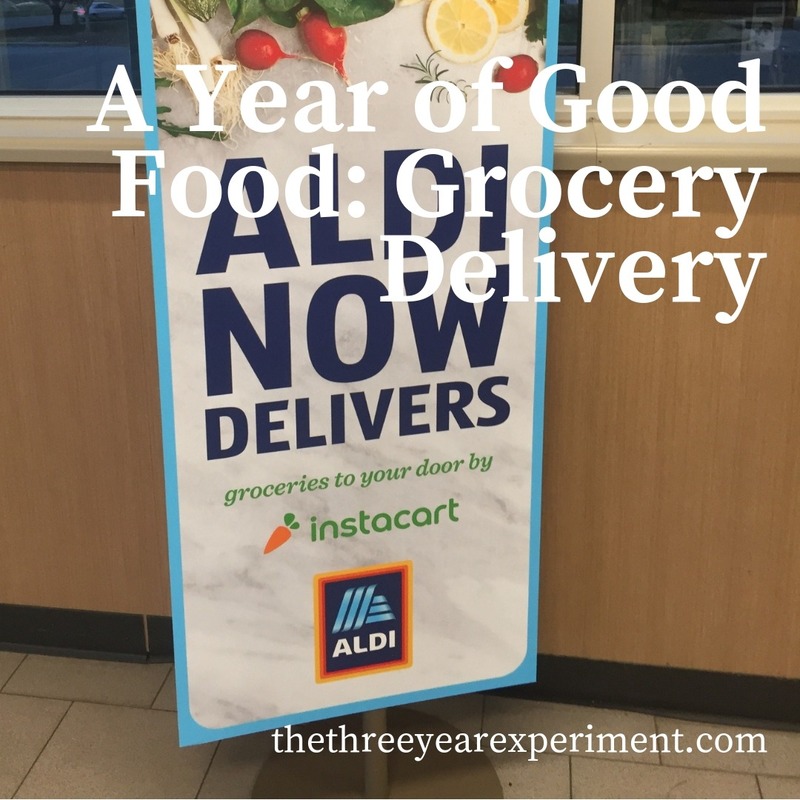 Just two more months left to report for our grocery experiment. November was a month that was supposed to be short and easy to stay in budget, but, alas, it wasn’t. Each month, we’re trying out a new way to save money at the grocery store. Last month, I tried to cook a bunch of food each Sunday for us to eat during the week. But because I didn’t make clear menus for each week, it didn’t work as well. While November was a short month, we packed a lot in. Mr. ThreeYear traveled for a week to New Hampshire. We went to South Carolina early in the month to visit my parents. We went to the beach for Thanksgiving. That meant that we were thrown off our routine and weren’t consistent and thoughtful grocery shoppers. A few extra expenditures took their toll this month. Let’s see exactly how. This was the first year I’ve had to buy Halloween candy in a long time. I wasn’t sure how much to buy so I ended up with three large bags. It was about right. We left a bucket on our front porch while we trick-or-treated and we still had candy left when we got back. It was a normal week’s worth of groceries. I got lentils at Earth Fare because Aldi doesn’t sell them, and something equally small at Target, maybe a loaf of bread. The Harris Teeter run was probably Mr. ThreeYear stocking up on drinks and other stuff. I bought groceries later in the week because of our trip to visit my parents (and Mr. ThreeYear being out of town). Side trips: $22.43, Harris Teeter. A couple of things early in the week like milk and bread. $4.24, Whole Foods, bay leaves. $8.05, IGA (at my parents’). $6.02, snacks on the way down to SC. Side rant: I went to Whole Foods to buy bay leaves in bulk. Bay leaves. I was waiting for someone (anyone?!) at Customer Service for about 15 minutes so they could tare my jar and then, when I was checking out, the lady input my tare wrong (charging me more than she should have). I told her, and she said, “No, I got it right.” Three seconds later, she handed me the receipt, and I said, “Oh, actually, it should have been .9 lb and not .09 lb.” “Oh,” she said, “you’ll have to go to Customer Service for them to fix it.” Arghh. It’s like they don’t care at all about charging you the right price. They just assume you’re not price sensitive (or in a hurry, apparently). Ok, rant over. 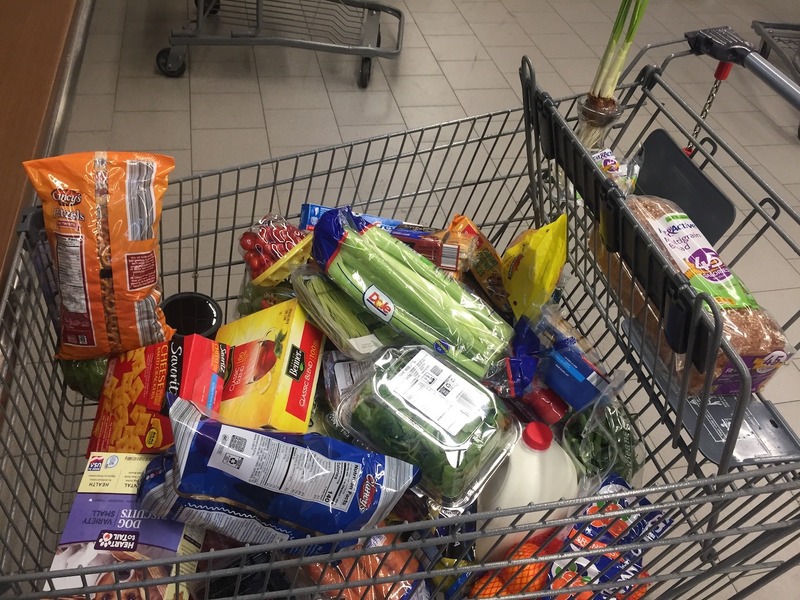 Week 4: $144.30, Aldi. Again, normal week’s haul, a little extra large because of Thanksgiving purchases. But get ready. The Harris Teeter runs were at the beach, where groceries are very expensive. Although I brought a bunch of groceries from Aldi with us for Thanksgiving, I forgot a lot of stuff (and we only had room for a very small cooler in the Prius) so we ended up heading to Harris Teeter a bunch. We went to Wal-mart for black Friday (later in the day) and bought a few more groceries and a gingerbread house kit. Little Three Year was so excited when we brought home a gingerbread kit. 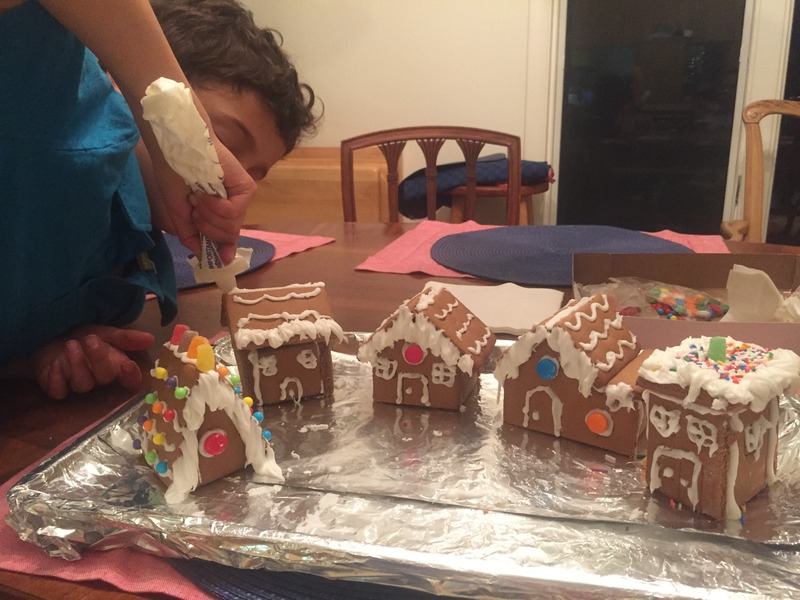 He spent all day decorating the tiny gingerbread houses. Ok, this brings me to this month’s experiment. 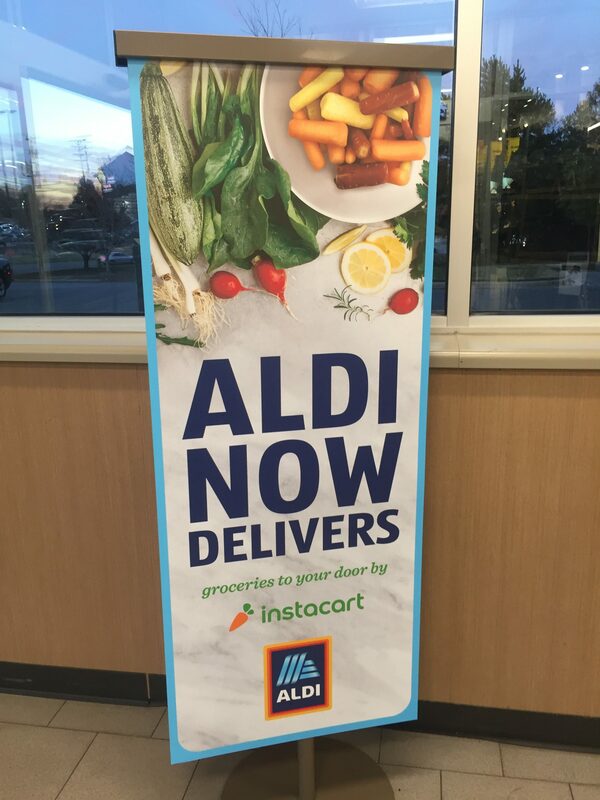 When I was in Aldi the other day, I saw a sign advertising grocery delivery for Aldi. I got really excited, because I’ve never tried grocery delivery service before but if they deliver Aldi groceries, well, that’s worth a try! I’m going to give my full report next month, but so far, I signed up for a free two-week trial and I’ve been very impressed. Yes, it’s more expensive. They charge a $4 delivery fee, a 5% “fee” fee, and you need to tip the driver, which has ended up being another 5% of my total. They also charge slightly more for each grocery item, around $.10-$.30 per item. But, I was able to order under $100, and I’m not tempted by items I see in the store because there are no last-minute purchases. The app’s easy to use and order with, and the shoppers have been fast (orders to you in under 2 hours from when you place your order) and friendly. My sister’s already a convert, and just in time, too, with a baby coming. I’ll report more after I’ve used it for an entire month. 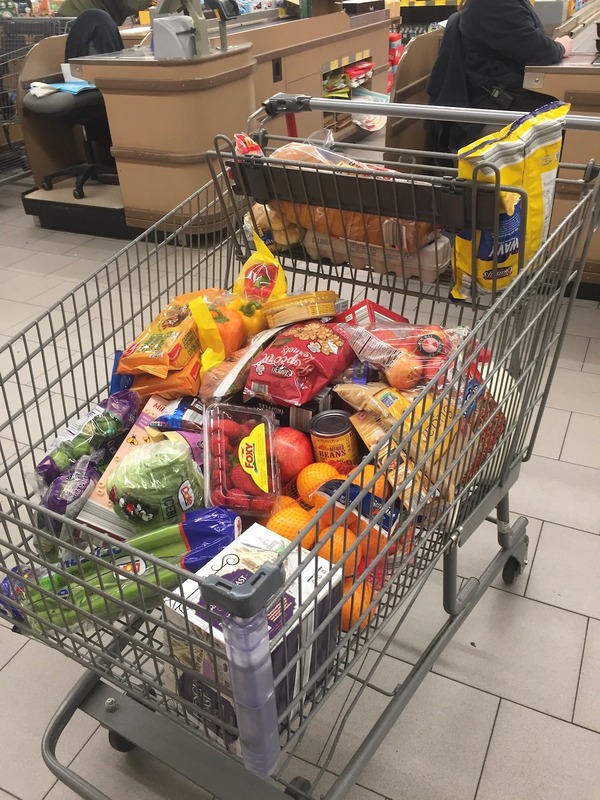 Lack of planning and side trips meant a higher-than-budgeted month for grocery spending. When life gets busy at the end of the year, a lack of planning inevitably leads to more side trips and less meal planning. We’re going to be at the beach for almost half the month, but I am going to be ordering groceries through Instacart as long as we’re here. We’ll see how I like it and what our spending is after an entire month. I have a feeling we’re going to have more side trips because we forget things (I’m not visually reminded to pick up more powdered sugar inside the store) but I’ll let you know. Hope your December is off to a great start! Dang it all, I forgot all about the cute little A frame when we made our gingerbread houses last weekend! It was a Wal-mart kit! Oh well, for next year! 🙂 I’ve definitely noticed that food is much cheaper here in NC, but yes, it seems like the boys eat more every single month! They go through a box of graham crackers in like 2 days! And a bag of tortilla chips in an afternoon. Voracious little parasites, and puberty hasn’t even hit! Oh well, we’re on the upward curve for a few more years, then we’ll start decreasing how much we’re buying! Wait, Aldi delivers?? I will totally have to check this out to see if it’s an option where I live. I love Aldi for many reasons. I actually used to recruit for them years ago which made me appreciate how they run their company. It rocked my world! Save $10 with this link. https://inst.cr/t/CaJWNz1ys That’s so cool that you used to recruit for Aldi. Seems like it’s a great company for employees, too!